From all across the West Bank, Palestinian activists came together in the village of the Tamimi family - a village and a family that has been targeted by Israel with all force and their steadfastness has become a symbol of Palestinian resistance. Young women in struggle played a key role in the event, held in the main square of Nabi Saleh. Their resilience, resistance and creativity in the national struggle was literally center stage, taking up protagonism and commanding respect. Janna Ayyad, a 12 year old Palestinian youth and media activists moderated the afternoon of speeches and cultural performances. She is cousin and friend of 17 year old Ahed Tamimi, who has recently been released on July 29 after eight months in prison. Her case has received incredible international attention and solidarity and she gave the main speech during the day. 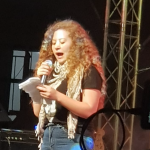 One of the main performances was given by Nai Barghouti, 21 year old singer and flautist. Speeches honoured the Palestinian prisoners and underlined the resolve of the people and activists from across the West Bank to continue popular resistance. The event was organised by the Stop the Wall Campaign and the Popular Struggle Coordination Committee in cooperation with activists from Nabi Saleh and the Tamimi family.